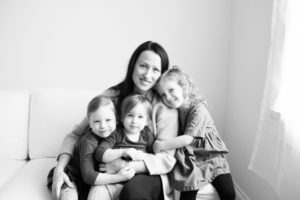 First up in the series is Samantha Gutmanis, founder of My Kitchen Love + Eastwood regular. A typical day involves waking up with 1 to 3 kids jumping into my bed yelling “wakey, wakey! Eggs and Bakey!”. There’s a mad scramble to get the coffee going and get all 3 kids (and somehow brush my hair) ready for the day. This ranges from a class at Eastwood to preschool to running around trying to get groceries and props for photo shoots. By the time lunch hits, I usually feel like an entire day has passed and I need to sit down and eat with my girls before tackling my afternoon. I work every afternoon. My youngest goes down for her nap and my 4-year-old twins get some playtime or help me in the kitchen. My work is … eclectic. Publishing a food blog as well as developing recipes for local brands and shooting photos for local companies means each day is never the same. Recipe development, recipe testing, photography, writing, pitching, social media, website updates, reading up on changes within the industry, invoicing, and so on means I have to tend to one task and then quickly change over and tackle another completely different task. It definitely keeps me on my toes. I end up working the afternoon away and then break for dinner with my family and to put the kids to bed. After their bedtime I usually work more until late at night and drop asleep before starting it all over again. – What made you interested in food? It tastes good? Just kidding. Sort of. I love the way food can break barriers, join people together and can truly change how we feel about our bodies. Most celebrations and humble moments in life revolve around food and it brings me much joy to cook for these occasions. – When + what made you decide to launch My Kitchen Love? My sister-in-law (hi Amanda!) encouraged me to do it in 2014. I was looking for something creative to pass the time while my twins were sleeping as my husband works long hours (I realize how crazy this sounds, but it’s true, I’m one of those people who thrives on being busy). Another baby later and I found my blog to be my creative outlet and a space where I wasn’t only “mom”, I had found a piece of me that could grow while still being at home with my kids. That this was going to turn into a business. I started blogging solely as a hobby to share recipes with family and friends, and it was surprising when more than family started following me and making my recipes. You never know where life’s surprises are going to take you. I didn’t get into food, besides seriously eating it, until I was in my late 20s. I so wish I had paid more attention to the recipes my late Nana made. I have a couple that I cherish dearly, but I wish I knew the history of the recipe and the importance to her. To raise caring empathetic individuals while still maintaining a sense of self and my relationship with my husband. I hate that I’m saying this, but Instagram. I love seeing what sort of love people are sprinkling around with food. Eastwood (obv. ), Eat Grain, Nature’s Path, Eastvan Jam, London Fields Shoppe, The Soup Solution, and so many more that I’m probably forgetting. If we’re talking Vancouver, Gastown. So much good food in one concentrated area 😉 Otherwise, North Shore, Lynn Valley specifically. I loved living downtown, but living in the hills with some really great neighbours and friends is unbeatable for our entire family. Check out Samantha’s recipes here.